There you are, staring at the red-slashed disaster that is your NCAA tournament bracket, questioning the decisions that felt so right just a short, hopeful week ago. Not ready to give up on the madness, you search for redemption in another bracket. You want something more serious, more real than deciding on nature’s cutest animals or best TV theme song — something that speaks to your policy and politics-minded sensibilities. Enter Twitter Fight Club. 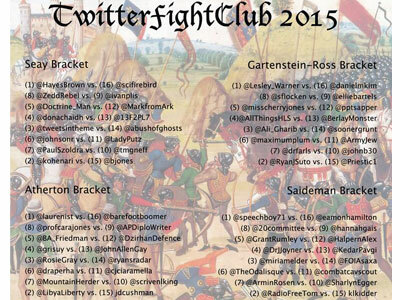 The origin story of Twitter Fight Club — or #TFC15, as it is known when contestants spar on Twitter — is in a joke about finding a way for Twitter’s NatSec and IR community to definitively crown its best tweeter. But give NatSec nerds a joke, and get back a bracket, seeding and judging system, and, added bonus this year: stats! The success of 2011’s inaugural bracket created an annual tradition, organized by writer Caitlin Fitzgerald (@caidid). Voting for the first round is currently underway. A link to the brackets, due before tomorrow morning, can be found here. A Twitter list that includes all participants can be found here. We’re including some sample #TFC15 tweets and zingers below. @abushofghosts Now you’re just getting desperate.